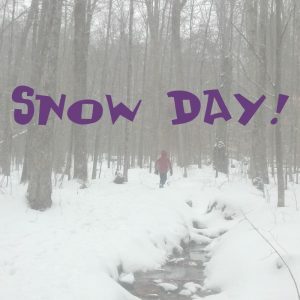 Following our policy of closing whenever the local school is closed, the Schroon Lake studio is closed on Wednesday, February 7th and Beth’s 9:30am Gentle Hatha class is cancelled for the day. Keene Valley is open only in the morning, for Teresa’s 8:30am Prana Flow Vinyasa. The evening Gentle Yoga class and Reiki Share are cancelled, as is Magda’s Thursday 9:00am Keep Strong, to allow time for our parking lot to be plowed. In Schroon Lake, Ginny’s Thursday 9:30am Connect to Your Breath is cancelled indefinitely as of February 8th. Ginny is caring for an injury that is keeping her off her yoga mat. We will welcome her back when her body is ready. Enjoy the snow day, stay safe, and stay peaceful!